Well, I couldn't fool you with what was nobigdill in the video. Every single person guessed right! I love that. Melissa Allen is the winner of the Neck Adornment! We've got a busy week ahead of us here at Magnolia Manor. I'm switching out a couple of my kids with a couple of my sister's kids, and everyone is thrilled about it. I'm grateful they've got cousins their age and that they actually know each other. We also have a 3-day scriptural reenactment that is taking place and I've got costumes I'm madly sewing. I keep telling myself that they're going to be worn for 10 minutes and they don't have to be perfect, but I'm also really good at ignoring myself ;). Meanwhile, I have been meaning to do this tutorial for over a year! I even went back through my thousands of photos and I already had the photos taken. 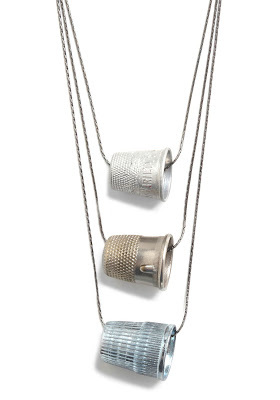 I saw this idea on Modcloth, but couldn't bring myself to pay what they were charging for ho-hum thimbles (plus, they're no longer sold anymore). So what do we do? We make it ourselves! I knew I could find some neat, vintage, all silver thimbles, so I went to town on ebay. I usually try to stay away from ebay, because I get suckered into bidding more than I would really want to pay, but I was also making them for my little sister and my mom. I still got suckered, and ended up with a whole bunch. 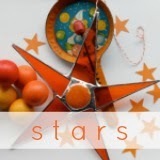 Perhaps I'll put some in my poor, stagnant etsy shop for those that just want to buy them already made ;). 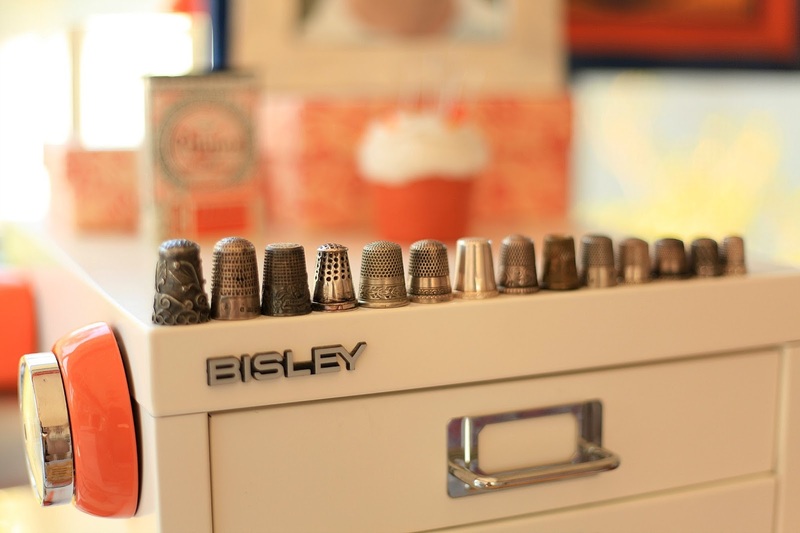 A few times I had to buy the whole lot for just one thimble I wanted, but I put a budget on how much I wanted to spend for each one, so I didn't really overpay. Too much. You just have to be patient and trust that even though the thimble you wanted got away, there will always be another thimble. There's an analogy in that somewhere. 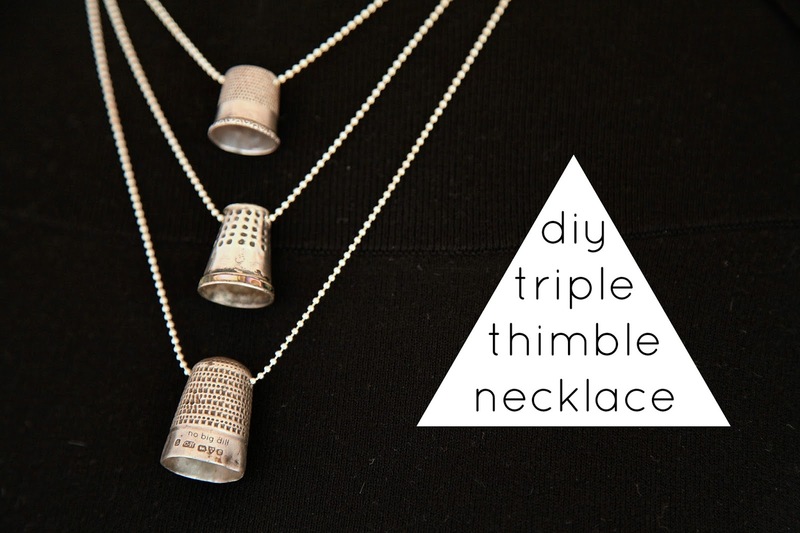 Something to note as you're buying your thimbles (or rummaging through thrift shops or your mom's stash) is the size of each thimble, because you'll want three different sizes. Buy one and then decide what size you'd like for your others. I just used my Dremel tool to make each hole, and instead of doing just one hole in the top like the ones on Modcloth, I did two holes so the thimble hangs straight. 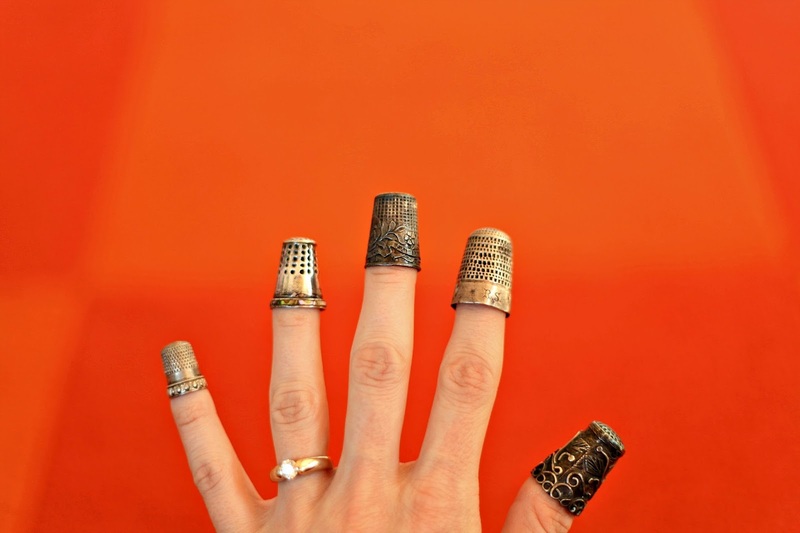 Each thimble is different and some were so thin and soft that I almost drilled through the counter (not really) and others took several minutes to make one hole. So, be patient in drilling the holes. 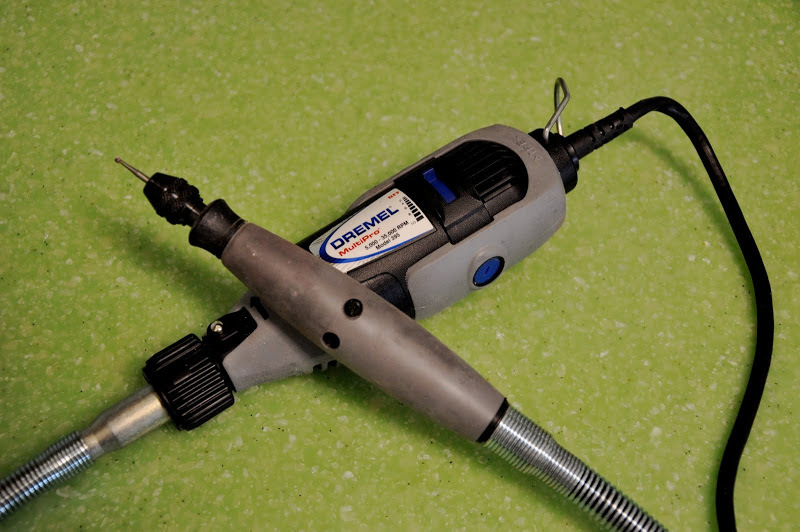 What I found works best is to make a small hole first, and then move the Dremel around the hole to enlarge it to the size of your chain. I put the entire chain through, but you could also use jewelry making supplies to put a small rod (is that what they're called?) and bend loops on each side. I used a sterling silver ball chain in a 1.5mm diameter size. I bought it in one continuous strand on Etsy (the shop I used is no longer in business, but there are lots out there) and made three separate necklaces, but you may want to attach them all together using a link chain and just one clasp. I will frequently wear just one thimble, so I don't mind that they're three separate necklaces. You just cut the chain with some wire cutters to the desired length. Make sure your chain comes with the clasp pieces to link them together. There you have it! It's one of my favorite pieces of jewelry because it's classic and represents one of my passions. this is so cool, katy! i love it! thanks for sharing! 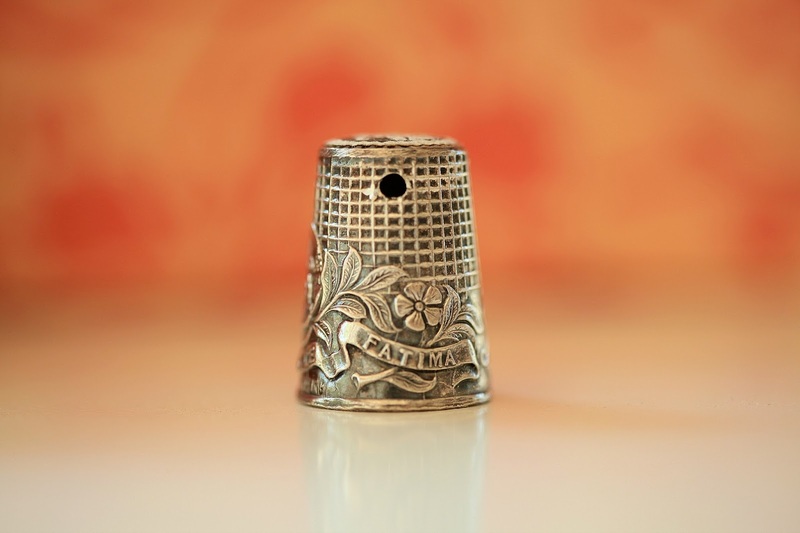 Katy, here's something weird about thimbles that I tripped over--did you know that up north, in the New England area in the 19th century, thimbles were common engagement presents? This is amazing! I'm off to find some thimbles! I like this idea!! Thank you! sohohoho awesome! 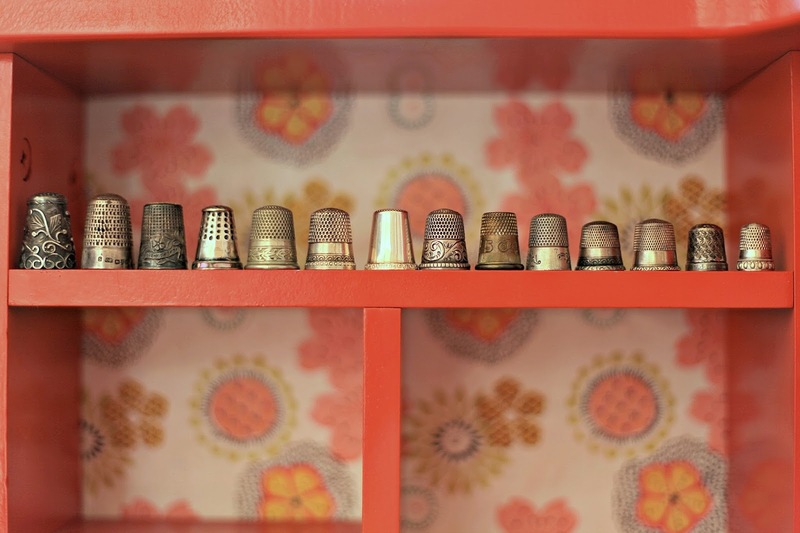 You wouldn't be able to tell that I adore thimbles, because I happen to own zero of them....but I really do. If antique shops were an option in my life, I would be popping into a few to search for thimbles. But I can't even let my kids out at world market. So beautiful. How did you engrave your "no big dill" logo? You've got crazy skills!!! those are fabulous! 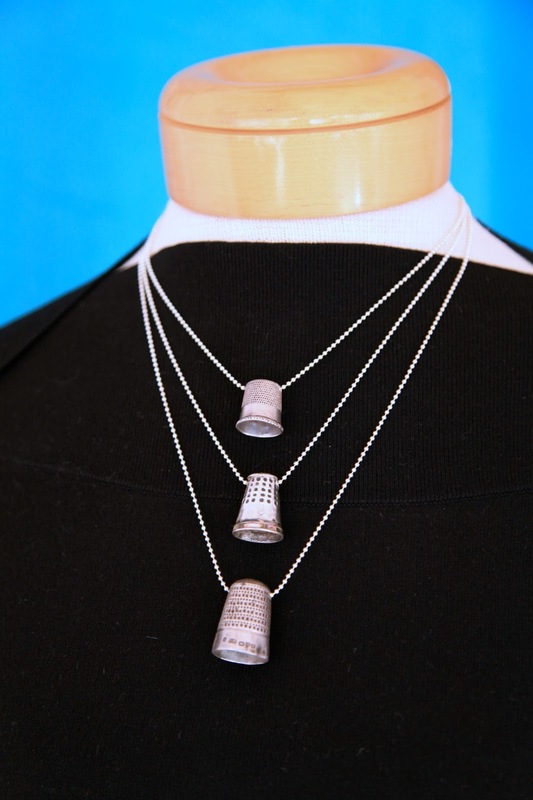 and prices on silver thimbles just went up on ebay;)!